Looks like the IPCC is not even wrong. There has been a heated debate between Judith Curry (Climate Etc.) and Tamino (Open Mind) about the temperature in the Arctic. This debate was initiated by Curry's testimony before congress two weeks ago. "I think the IPCC goofed on this one — big-time — and if so, then Curry’s essential argument about Arctic sea ice is out the window. I’ve studied the data. Not only does it fail to support the claim about 1930s Arctic temperatures, it actually contradicts that claim. By a wide margin. It ain’t even close." That sounded convincing, but I am not so sure about the IPCC any more. Later she also wrote a reply on her blog, Climate Ect., starting with the above quote from the IPCC report. A question as recently as six years ago was whether the recent Arctic warming and sea ice loss was unique in the instrumental record and whether the observed trend would continue (Serreze et al., 2007). Arctic temperature anomalies in the 1930s were apparently as large as those in the 1990s and 2000s. There is still considerable discussion of the ultimate causes of the warm temperature anomalies that occurred in the Arctic in the 1920s and 1930s (Ahlmann, 1948; Veryard, 1963; Hegerl et al., 2007a; Hegerl et al., 2007b). The early 20th century warm period, while reflected in the hemispheric average air temperature record (Brohan et al., 2006), did not appear consistently in the mid-latitudes nor on the Pacific side of the Arctic (Johannessen et al., 2004; Wood and Overland, 2010). Polyakov et al. (2003) argued that the Arctic air temperature records reflected a natural cycle of about 50–80 years. However, many authors (Bengtsson et al., 2004; Grant et al., 2009; Wood and Overland, 2010; Brönnimann et al., 2012) instead link the 1930s temperatures to internal variability in the North Atlantic atmospheric and ocean circulation as a single episode that was sustained by ocean and sea ice processes in the Arctic and north Atlantic. The Arctic wide temperature increases in the last decade contrast with the episodic regional increases in the early 20th century, suggesting that it is unlikely that recent increases are due to the same primary climate process as the early 20th century. IPCC(2014, draft, page 10-43 to 10-44). Steve Bloom dryly comments: "So it was a question in 2007." In other words, the IPCC was right, but Judith Curry selectively quoted from the report. That first sentence is very important, also the age of the references could have revealed that this paragraph was not discussing the current state-of-the-art. The data of the last six years makes a large difference between "with some goodwill in the same range of temperatures" to "clearly higher Arctic temperatures". 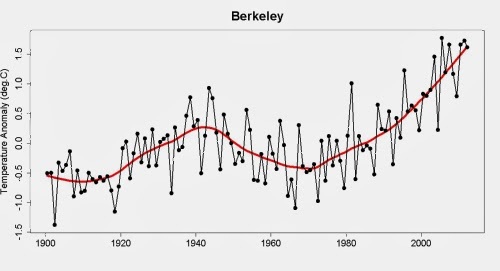 This is the annual average temperature in the Arctic from 60 to 90 degrees North as computed by the Berkeley Earth Surface Temperature group. The smooth red line is computed using LOESS smoothing. And the misquotation is not for lack of space in the testimony. In her blog post, Curry quotes may sections of the IPCC report at length and also the entire paragraph like it is displayed here, just somehow without the first sentence printed here in bold, the one that provides the important context. The congressional Testimony by Curry: STATEMENT TO THE COMMITTEE ON ENVIRONMENT AND PUBLIC WORKS OF THE UNITED STATES SENATE Hearing on “Review of the President’s Climate Action Plan" 16 January 2014, Judith A. Curry. (One of) the Problem(s) with Judith Curry by Tamino at Open Mind. The reply by Curry about Tamino's post on her blog, Climate ect. The answer to that by Tamino suggests that Curry's reply is not that convincing. Also Robert Way contributed to the discussion at Skeptical Science: "A Historical Perspective on Arctic Warming: Part One". Robert Way made the round in the blog-o-sphere with the paper Cowtan and Way (2013), where they studied the recent strong warming in the Arctic and suggested that that may explain a part of the recent slowdown in the warming of surface temperature. A previous post of mine of Curry's testimony, focussing on her suggestive, but non-committal language: "Interesting what the interesting Judith Curry finds interesting". I am a little late with this, I just came across the Week in review by Judith Curry. If there is one thing that annoys me about the way Curry communicates, it is her suggestive, but completely non-committal language. The exact opposite of what I am used to among scientists. The word "interesting" is one of her favorite suggestive words. Or try refuting global warming. Temperatures have stopped warming for more than a decade? That’s just a temporary “pause” in the warming that we just know is going to come roaring back any day now. Antarctic ice is growing? That’s actually caused by the melting of ice, don’t you know. A vicious cold snap that sets record low temperatures? That’s just because the North Pole is actually warming. So if the winter is warm, that’s global warming, but if the winter is cold, that’s global warming, too. If sea ice is disappearing, that’s global warming, but if sea ice is increasing, that’s global warming. Now we can see what they mean when the warmthers say that global warming is supported by an ironclad scientific consensus. The theory is so irrefutable that it’s unfalsifiable! Which is to say that it has become a cognitive spaghetti bowl full of ad hoc rationalizations, rather than a genuine scientific hypothesis. This is pure and utter nonsense. Let me just discuss the main point, all the other denier memes are debunked at Skeptical Science. It is very easy to falsify the theory of global warming by greenhouse gasses. If there would be an unexplained temperature drop of one degree and it would stay there for a decade, the theory is completely dead. If the same thing happens to the ocean heat content, the theory is dead within a year. RealClearPolitics is right in suggesting that anything that will actually happen is very unlikely to refute the theory. Quite of lot of basic science would need to be wrong. And RealClearPolitics is right in suggesting that it is not sufficient for something to happen what feelies intuitively feel should not happen in a warmer climate. You do need some actual proof that the phenomenon should behave that way. His blog is at least honestly called a political blog. Judith Curry is very intelligent and has much experience as scientist. She naturally knows that this quote was nonsense, but also that her audience likes it. Thus she non-noncommittally calls it interesting. My wish for 2014 is that Curry comes back to the scientific community and stops using the word "interesting" so much. The scientific way of trying to understand why there is a difference of understanding is making it clearer what you mean.